My allergies have been crazy this week so it seems fitting to blog about a costume that i’m allergic to! I’m not even kidding. The only thing I learned from making this is that burlap, plastic moss, and real moss are three materials I will never be touching again. With that cheery intro, lets talk about this project! 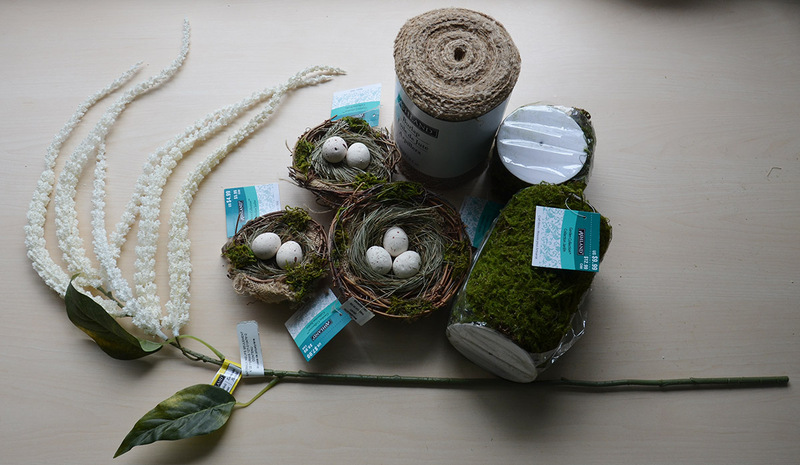 I found some really neat fake bird nests, flowers, and moss from Michaels. They were on sale and I found the textures really interesting and unlike anything I had worked with before. So I bought them. I decided to make a forest sprite costume. This was a challenge for me, since I wanted something that would blend in with the forest environment but also be a pretty standalone dress. I wanted the materials to be really prominent in the dress, and for it to have a lot of texture. 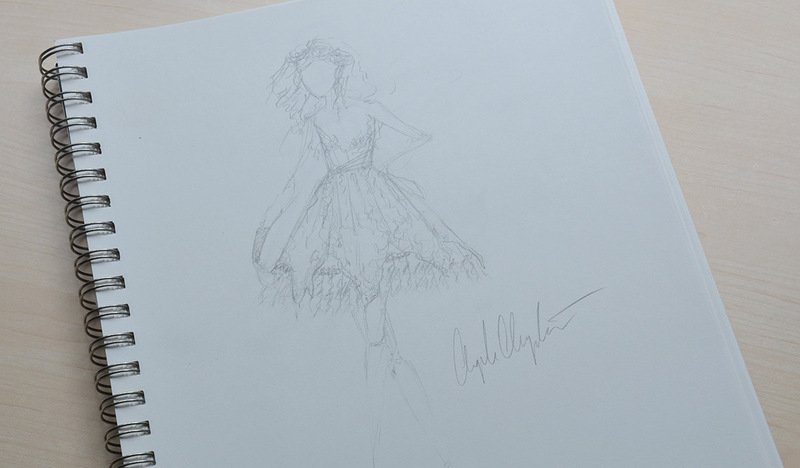 My original plan was to have layers of petal shaped organza and tulle gathered at the waist, which is shown in this sketch. But I scrapped that idea pretty quickly. Even though the skirt design wasn’t completely clear in my mind, I knew what I wanted the bodice to look like. So I started draping it. 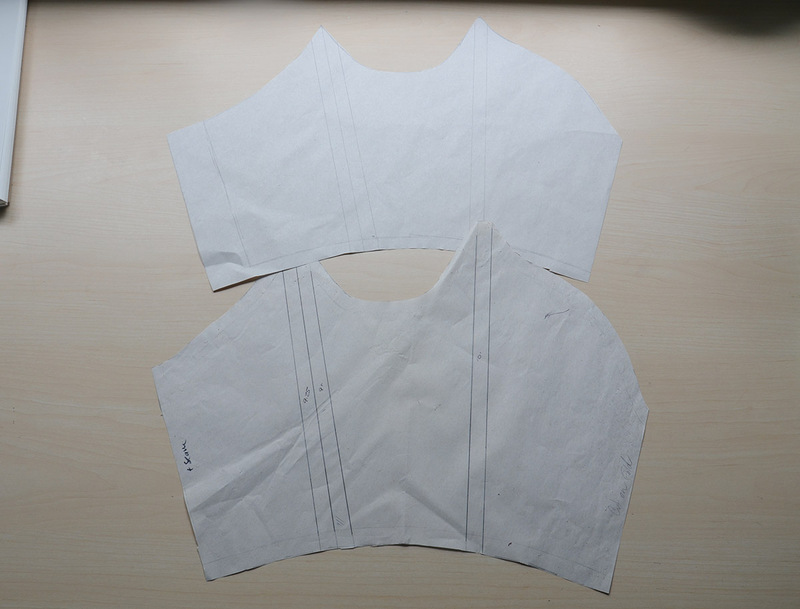 I was ten minutes into the draping process when I realized I had already made a bodice very similar to the one I was trying to create. 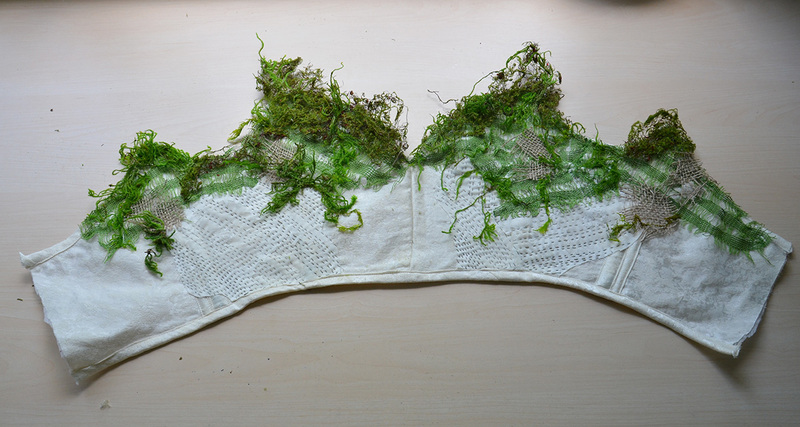 It was pretty much identical to my Fall Forest Fairy bodice. I still had the pattern for that, so I decided to reuse it. All I did was fiddle with the neckline a bit and lengthen it at the waist. 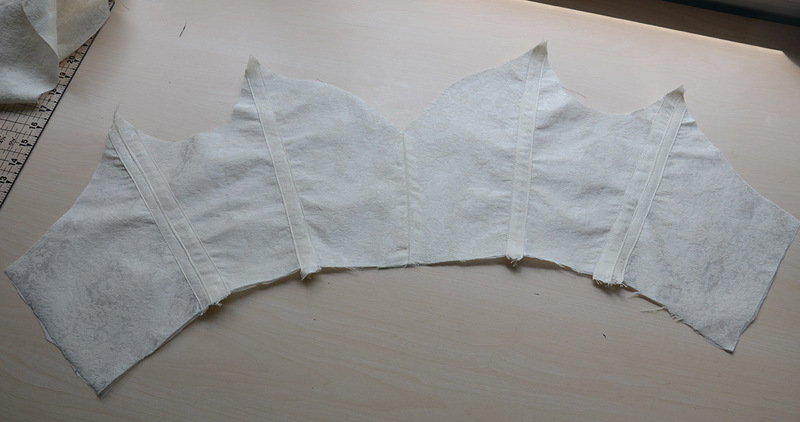 I cut the bodice out of a ivory brocade fabric. This fabric is kind of thin on its own, so I backed it with fusible interfacing. Then I added the boning and boning channels. I covered the edges with half inch wide home made bias tape, which was sewn on by machine. The top edge will be completely covered in moss and netting so I wasn’t too particular about how it looked before those things were added. I covered the bottom edge with bias tape as well. The bodice fit well enough that I felt comfortable moving on to decorating it. I wanted this to be packed full of texture so I decided to do some fancy stitchwork. 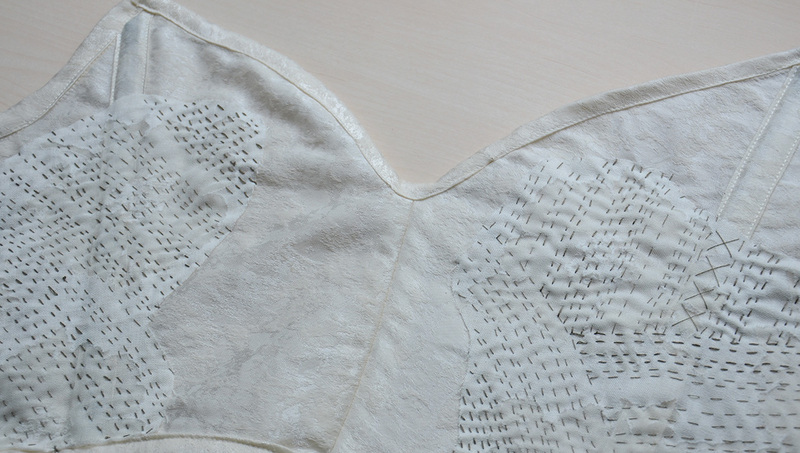 This isn’t really embroidery, it’s just a running stitch repeated every eighth of an inch. 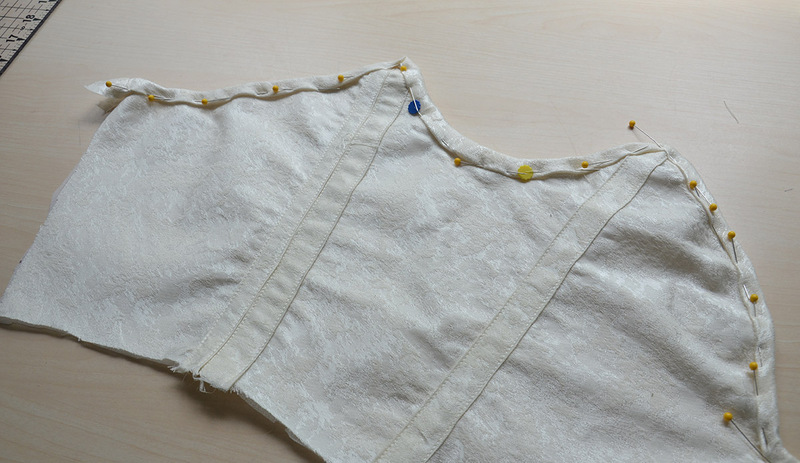 The stitching attaches floral print chiffon (I left the edges of it raw) to the sides of bodice. I didn’t do a very precise or pretty job of this – but I wasn’t trying to do either of those things. I just wanted to add texture, and I think the irregular pattern does a better job of that. 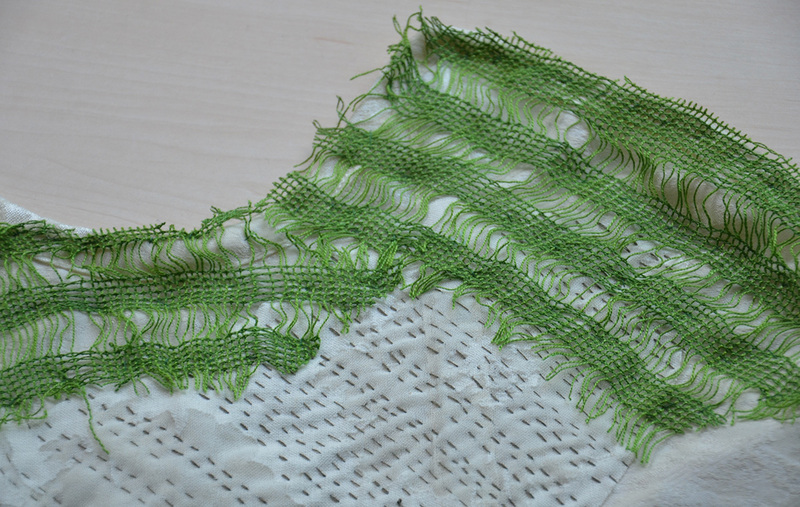 Then I pinned some mesh over the neckline. I pulled at the edges until they looked torn and frayed. It all got sewn down by hand. Then I added the moss. I used a mixture of moss that came on a spool, which was plastic, and moss from a bag which was real. I DID NOT know the bagged moss was real until after buying it and having it sit in a drawer for a month. It was pretty awful to work with since the ratio of green moss to sticks and dirt was about 50/50. I felt like bugs were going to crawl out while I worked with it. But the fake moss was almost as bad. I think it’s made by spraying flocking over a wiry plastic base. Which I usually wouldn’t have a problem with but in this case the flocking was made up of tiny plastic spines which get all over your skin, into your eyes, and nose. They have a texture that makes me itch. So this part of the process wasn’t a lot of fun. After maybe an hour I got everything oriented and glued on in a way I liked. The bodice was finished with a few burlap patches which were also hot glued on. 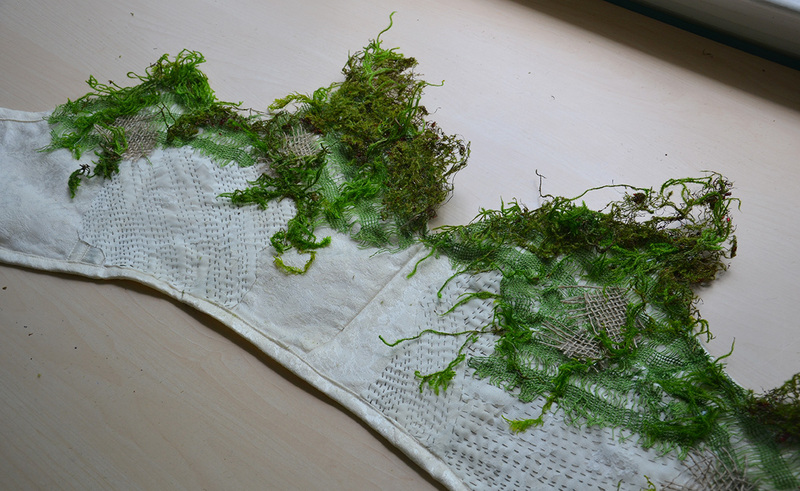 To completely hide the top edge of the bodice (which was the ivory fabric) I had to extend the moss into the interior of the bodice. I can’t really line it without it showing, so the moss remains pressed against my skin which adds another level of discomfort to this costume. My chest does not deserve the pain this plastic itchy moss from hell inflicts on it whenever I wear this. But it looks really cool! So that makes it worth it. kind of. 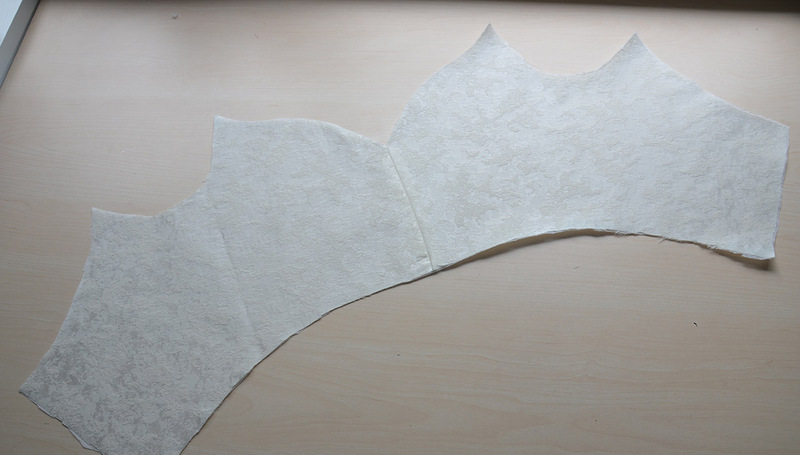 Thats it for the magical forest spire bodice. Next week i’ll go over the process of making the skirt. I’m so sorry about the itchy moss! I’m not allergic to anything, but I’m sure it is acutely uncomfortable. 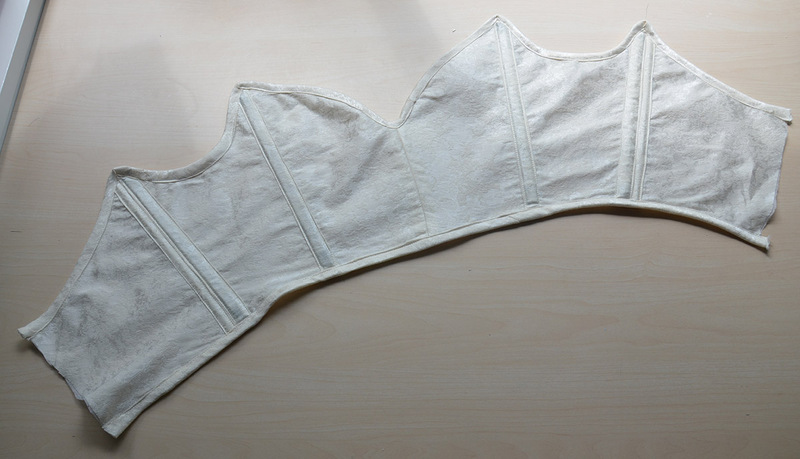 The bodice does look amazing! It looks like something that should come straight out of a live-action tinkerbell! I enjoy reading about your creative process, I have to admit I laughed about your moss from hell. I can’t wait to read your next installment on the Forest Sprite. I am constantly amazed by you! Seriously, I fall in love with everything you make! I was thinking regards the lining at the top of the costume.Could you not dye some lace in the green to match the moss.? ?.I think you are a very talented young woman..We will be hearing and seeing your name in years to come .I think you will become very famous..Good luck Angela..
You have awesome talent! Sorry, you are having reactions from the ‘moss from hell’ hahahaha; but I can’t wait to see the full completed outfit! If you react allergic to your costume, you should not wear it! 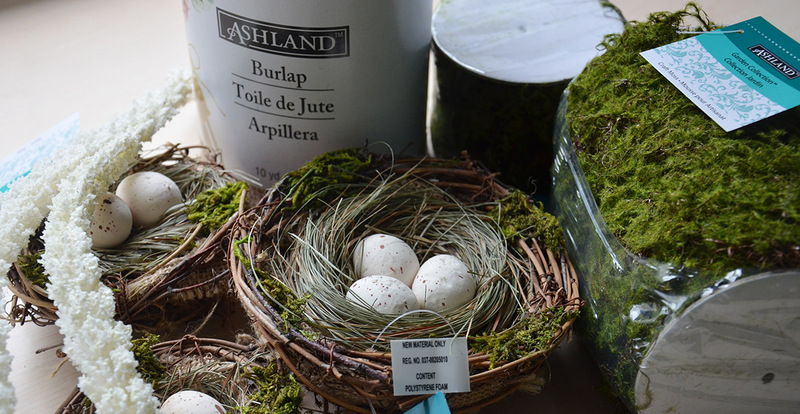 Could you put some organza between the moss and your skin or spray it with clear varnish? I found this on tumblr and it made me think of you and your dresses.